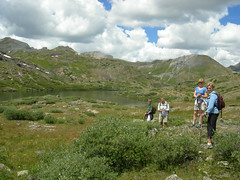 On August 20, Marcia, Linda, Connie, Robin, Celia and I hiked up the Highland Mary Lakes Trail. The trailhead is 9 miles north of Silverton on a mostly smooth dirt road, with one stream crossing before the parking area. The trail is steep steep steep! It was mostly dry and rocky, with just one boggy area near the top. We followed Cunningham Creek all the way up, and we passed many cascades and waterfalls. This is Marcia and Robin leaving our lunch spot at Lake #3. And here's Linda, Robin, Celia, and Marcia in front of Lake #2 on our way down. The wildflowers were really past their prime, but there was a lot of color still along the trail. Unfortunately, it rained a bit on our way down, so I did not take many photos. Just as we got back into the car, the downpour really started. What a great hike!